The Department of Transportation (DOT) published a final rule in the Federal Register (82 FR 52229). You can find a copy of the final rule on ODAPC’s web site www.transportation.gov/odapc/frpubs. Effective January 1, 2018, laboratories have added four semi-synthetic opioids: hydrocodone, oxycodone, hydromorphone; oxymorphone to your DOT testing panel. Employees will be tested for four semi-synthetic opioids (i.e., hydrocodone, oxycodone, hydromorphone, oxymorphone). Some common names for these semi-synthetic opioids include OxyContin®, Percodan®, Percocet®, Vicodin®, Lortab®, Norco®, Dilaudid® and Exalgo®. In addition, employees will no longer be tested for MDEA. As a C/TPA we always advise companies to educate employees about the opioid epidemic; communicate the risk factors for opioid abuse and stress the importance of responsible prescription use. It is also important to provide support and safe return to work for injured employees, and communicate treatment options, if needed. Employers can also remove the sub-categories of drugs and just refer to ’49 CFR part 40.’ If cut-off levels are listed in current policies, employers must update those cut-off levels or refer more generally to the applicable cutoff values stated in 49 CFR part 40. You should notify your employees of these new changes immediately. NOTE: This document informally summarizes some of the important effects of the rule, but it is not a substitute for the rule and should not be relied upon to determine legal compliance with the rule. CCM encourages affected entities, including employers and service agents, to review the final rule. www.transportation.gov/odapc/frpubs. Will these changes result in a price increase for me (the customer)? Yes. The regulatory changes require that SAMSHA certified labs add four additional drugs to their testing panel- an increase in the number of drugs being tested for by the lab means a modest price increase per DOT specimen processed at the lab(s). The Medical Review process has also changed, and may contribute to an additional cost as well. Will these changes cause a delay in me (the customer) receiving results? No. Results will be communicated to the employer as normal. When should I inform my employees of these changes? You should inform your employees of the additional drugs being tested for immediately. 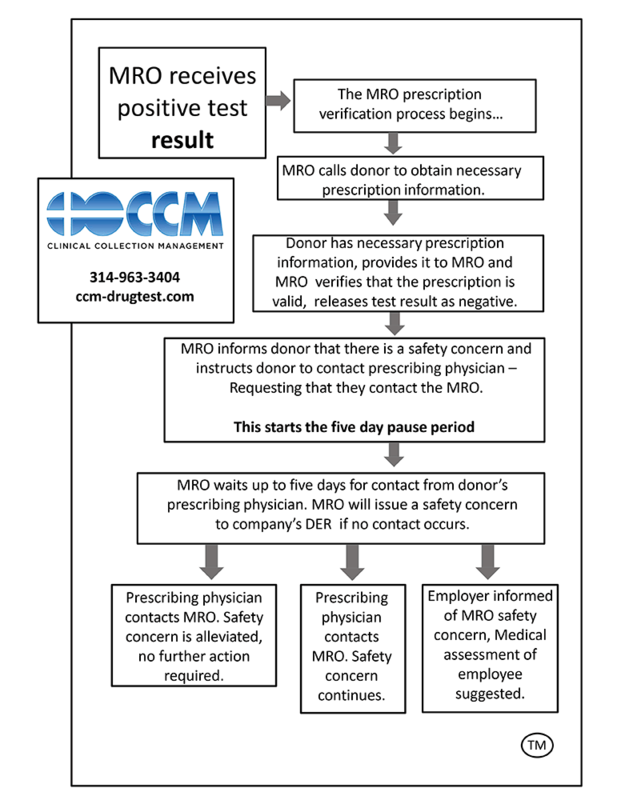 Employees who are currently prescribed oxycodone, oxymorphone, hydrocodone and hydromorphone should be made aware of the required actions following a safety concern issued by the MRO. Will CCM provide an updated policy regarding these changes? Yes. As your TPA / Consortium we offered to provide you a policy, therefore we will provide you an addendum to that DOT policy. If your policy was not provided by us we will need to review your policy prior to providing you an addendum. Have a question about DOT changes? Send it to us using this form. Answers sent back promptly.